The 20 coolest beach towns in America are about drinks at sunset and living in flip-flops. They’re about waking up with sand in your sheets and going to work barefoot. Perfect days here are ones with the right wave, the right wind, or the right fish. And the people who live here know the one thing they could never live without is the ocean. 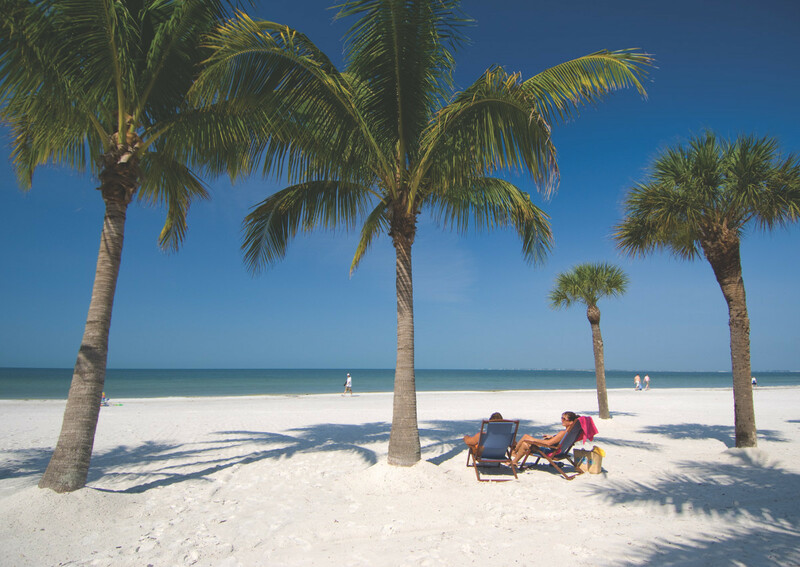 There are more than enough reasons to love Fort Myers and Sanibel Island: great weather (the Gulf water averages 76 degrees, almost never dipping below 60 even in the wintertime), delicious food (it’s rumored that Jimmy Buffett wrote “Cheeseburger in Paradise” after dining at an area restaurant), fantastic outdoor sports. It has the best of Florida, without the over-development. It’s also been repeatedly voted as the #1 shelling beach in the nation by Travel + Leisure. Drinks: Peel ‘n eat shrimp and a cold beer at the Lazy Flamingo. Eats: Stop by Andy’s Island Seafood Mobile Truck. Also visit Sanibel Farmer’s Market and the Captiva General Store. Coffee: Visit The Island Cow for a big breakfast or lunch. Try a slice of Key Lime Pie at the Key Lime Bistro. Things to do: Visit Bowman’s Beach, one of the world’s best shelling beaches. Cheer on spring training baseball in Fort Myers. Visit the Edison & Ford Winter Estates Museum. Check out the the National Shell Museum and paddle in the JN “Ding” Darling National Wildlife Refuge. Explore the Matlacha Pass National Wildlife Refuge. Looking for a beach town that embodies the slow life? You’ve found it. Stinson, a cherished staple of Nor Cal folks, sits between the Pacific Ocean and Mt Tamalpais, an area with some of California’s best views and hikes through old growth redwood forests. The town’s main drag doesn’t have a single stop light and during the week, you might have the beach literally to yourself. Drinks: Have a freezing cold Mirror Pond draft at Sand Dollar Restaurant. Eats: Stop in for a gourmet meal at Parkside Cafe. Things to do: Visit Stinson Beach State Park and take any of the several hikes that stem from the beach. Martha Stewart vacations in this artsy town that has access to Acadia National Park as well as some of Maine’s best sandy beaches. Drinks: Cottage Street Pup has super interesting drinks, located in a hallway-sized space. Or, for an outdoor gazebo bar where the locals go, visit the Dog and Pony (they’re also the only place to get food late-night). Eats: McKay’s Public House has a great lobster mac and cheese in a fabulous ambiance (a historical building with outdoor seating in the summertime, and fireplace tables during winter). The restaurant also has the town’s best local and international beer selection (they even have a cask-conditioned tap line). Ask for Chris ‘Rome’ Romero, their locally-famous bartender here; he knows all there is to know about beer and brews his own. Cafes: Two Cats bakery has a huge outdoor covered porch and a really good breakfast burrito. Jordan Pond House is known for their homemade Maine blueberry jam. Cafe This Way also serves excellent bloody mary’s. Things to do: Stay one night in the Acadia Yurts in nearby Southwest Harbor. Hike the peak of Cadillac Mountain, where the first sunrise in the United States is said to occur. Go whale watching. Visit the Abbe Museum for Native American artifacts from the region. Drinks: The Warren House Pub offers locally brewed beers (or visit Bill’s Tavern and Brewhouse, its sister location in downtown). Cannon Beach Distillery produces small batches of gin, rum, whiskey and agave spirits. Two wine shops also offer wine tastings: The Wine Shack (offering a good selection of Northwest wines) and Puffin Brand wines (named after the puffins that nest on Haystack Rock). Eats: Splurge on fine French and Italian dining at Newman’s. Explore Northwest seafood at The Wayfarer Restaurant. For casual food in a nice setting, have a soup or sandwich at Seasons Cafe. Coffee: Sleepy Monk Coffee features coffee roasted locally. Other things to do: Take a picture near Haystack Rock–the rock from Goonies and the final scene of Point Break. Visit Ecola State Park where you can hike through rainforest and scenic beaches. Visit one of the dozens of art galleries in downtown. Only a half hour from Savannah, this 2.7 square mile island (where Sandra Bullock owns a house) has the quiet, southern hospitality you’d expect from Georgia. Drinks: Rock House Bar has kareoke Sundays and live music throughout the weekend. Go dancing during their “Seduction Saturday” parties each week. Eats: Eat Pecan waffles at the Breakfast Club, the restaurant that famously catered JFK Jr.’s wedding. Try Low Country Crab Boil at the Crab Shack. Cafes: Tybee Art and Coffee. Things to do: Visit the Tybee Lighthouse. Watch dolphins on one of the area’s boat tours. Drinks: Joe’s Cafe has been around forever and is famous for serving the strongest drinks in town. Visit Santa Barbara Brewhouse or get drinks right on the beach at Boathouse. Go wine tasting in the Santa Ynez Valley (check out Rancho Sisquoc winery). Eats: Have breakfast at Mesa Lane Cafe or Summerland Beach Cafe. Have dinner at Brophy Bros.
Music Venue: Santa Barbara Bowl, home of Bob Marley’s last show. Things to do: Hike or mountain bike off of Chumash Pass or just cruise down at Hendry’s beach. 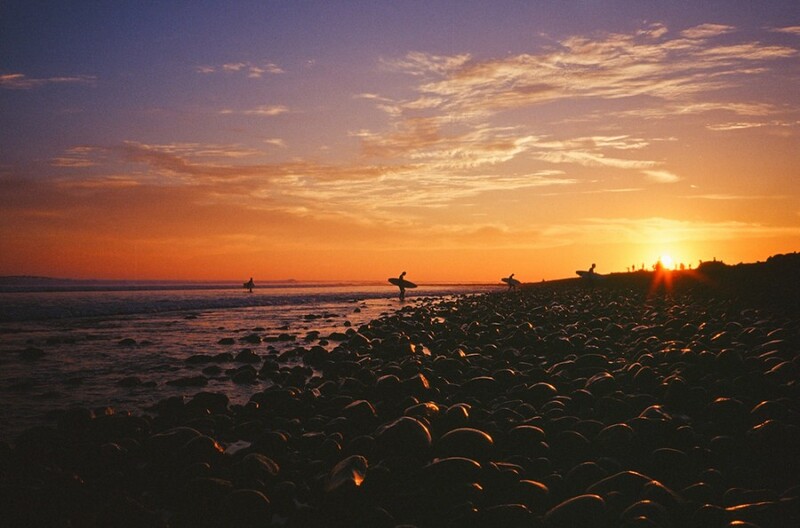 Dawn Patrol in the water at Rincon during a firing WNW swell. Unlike a lot of the boardwalks on the Jersey shore, this town is neither douchey, tacky, or owned entirely by the 1%. And it’s got a bar, restaurant, and live music scene that’s better than most small cities. Drinks: The Anchor’s Bend has drinks on the beach and great live alternative music. Or visit Asbury Festhalle & Biergarten, Brick Wall, and Watermark before heading downtown for a cheap beer and greasy drunk food at Bond Street. Eats: Start the morning with a pork roll, egg, and cheese sandwich at the legendary Frank’s Diner. Visit Happiness Luncheonette, Mogo, Taka, or the Speakeatery (try the cheesesteak: it’s better than anything you’ll find in Philly) for lunch. Coffee: Asbury Park Roastery, Cafe Volan, and Lola’s European Cafe (don’t just get the coffee: try the sandwiches and gelato). Music Venue: The Stone Pony, has a summer stage close to the beach and always a great line-up. You can also catch music at Asbury Lanes, the Saint, and Wonderbar. Things to do: Check out some of the art galleries on Cookman. Get a cocktail on the beautiful Watermark Rooftop, and then hit up the weekly beach bonfire. Take your kids to the Splash Park on the other side of the boardwalk. Take your dog to the Dog Run Beach on the Northern end of town, or to Wonderbar’s Yappy Hour. This small coastal town has white sand beaches and Southern charm, but also a flourishing artistic community that helps build a full calendar of cultural events. Drinks: Buoy’s Bar has live music and drinks right on the beach. Or, visit The Blind Tiger. Eats: The Buttercup on Second Street. Coffee: Mockingbird Cafe is a bookstore/town meeting spot/pub by night. Stay a while to see the whole town pass by. Other things to do: Catch a show at Bay St. Louis Little Theater. Visit the artist co-op (Gallery 220) or Maggie May’s art gallery. Drive less than an hour to New Orleans to enjoy the city’s nightlife for the evening. Drinks: Pied Bar is the longest continuously running lesbian bar in the country. Crown Anchor Provincetown is another popular gay bar in town. Aquabar has a great ambiance for cocktails on the beach. Eats: A late breakfast at Manuel’s in Port Isabel (no need for lunch, that way). Head to Boomerang’s for a small lunch. Or grill lobster tails and shrimp from Dirty Al’s for dinner. Coffee: Joe’s Coffee and Cafe. Other things to do: Sunbathe on peaceful Herring Cove. Visit Race Point Beach, the protection of the Cape Cod National Seashore. Visit the gallery-lined East End of Commercial street. Hawaii without the hastle, Pāʻia (population only a little over 2,000) is the last town on the Hāna highway and has often been called the “World Capital of Windsurfing”. Drinks: Cafe Mambo for happy hour. Rock and Brews Paia for the largest selection of craft beers on Maui. Eats: Visit Paia fish market for the best fish lunch plate. Tobi’s Shaved Ice for dessert. Other things to do: Windsurf at famous spots Ho’okipa and Spreckelsville. Or, instead of going to Ho’okipa, the surf and play is just as good in Paia bay. The north edge of the bay also has countless sea turtles hanging out on shore all day. USA Today named Wilmington’s riverfront the best in America. The town is also a site for historic ships like the USCGC Diligence or the World War II battleship USS North Carolina. Drinks: Front Street Brewery has craft beer. Hell’s Kitchen Bar is a sports bar during the week and hosts live music each weekend. Eats: Manna Avenue for fine American cooking. The Pilothouse is a historic building (built in 1870) turned into a restaurant famous not only for its menu, but also its romantic main dining room perched on a deck overlooking the Cape Fear River. Coffee: The hangout spot for the town’s bohemians, the Juggling Gypsy has hookah, coffee, a bar and “fringe performances” on weekends. Music venue: Ziggy’s By The Sea. Other things to do: Take a stroll through the 67 acre historic Airlie Gardens or take a walk down the Riverwalk. Just 16 miles away from the college town of Arcata, Trinidad is noted for boasting ten public beaches in one small town of less than 500. Drinks: Try award winning wines at Moonstone Crossing. Bergeron Winery also allows wine tasting with a view of the redwoods. Eats: Seascape Restaurant and Pier. Other things to do: Trinidad State Beach, Patrick Point’s State Park, Trinidad Art Gallery. This tiny, seven-by-three-mile island was named the “Best Beach for Solitude” by Yankee Magazine and has a lively community that more than makes up for its size. Drinks: Poor People’s Pub or Yellow Kittens for live music. Eats: Froozies Juice Bar and Cafe for a healthy breakfast burrito. Go to the Beachhead restaurant for New England classics like lobster salad rolls, Corn Neck calamari or Block Island clam chowder. Shop: Visit Block Island Blue Pottery on Dodge Street or East of the River Nile Trading Company for quirky items from around the world. Other things to do: Many people rent bikes to explore the island. Visit the Mohegan Bluffs (often compared to the cliffs of Ireland). Visit the well-photographed Southeast Lighthouse. Visit Spring Street Gallery for work by local artists. Kill Devil Hills is the cultural and geographic center of North Carolina’s Outer Banks. It has a rich history both as the birthplace of aviation (The Wright Brothers tested and flew their first gliders and airplanes in the huge dunes) as well as nautically: The Outer Banks are littered with shipwrecks (“The Graveyard of the Atlantic”) going all the way back to Blackbeard the pirate. Drinks: Chip’s Wine University is the least snobby wine tasting you’ll find. The market sells a great selection and also offers unpretentious introductory courses on wines around the world. Eats: Eat dinner at the Blue Moon Grill or Pigman’s BBQ. Shop: Check out the Tanger Outlets at Nags Head. Other things to do: Access the National Coastline from here all the way down to Cape Hatteras and on to Ocracoke via ferry. Visit the Wright Memorial museum for a look at the first brothers of flight. Hang out at the Avalon Fishing Pier. Visit Nags Head Woods Preserve. The setting for the 1960’s sitcom I Dream of Jeannie, this town first gained popularity because of its close proximity to NASA‘s John F. Kennedy Space Center (only 15 miles away). Drinks: Cocoa Beach Brew is the local brewing company. Eats: Coconuts on the Beach. Coffee: Juice n’ Java Cafe for coffee, or ice cream at The Fat Donkey. Other things to do: Visit the East Coast Surfing Hall of Fame or attend the annual Eastern Surfing Festival which can draw over 50,000 visitors. Surf at Lori Wilson Park. See stand-up at Gregory’s Comedy Club. Twenty minutes from Charleston, Folly Beach is its own super chill beach community with one of the most consistent surf breaks (“The Washout”) on the US Atlantic Coast. Drinks: Loggerhead’s, or go to the local dive bar: Planet Follywood. Eats: Visit Taco Boy, the ultimate in fresh fish tacos and guac. Have a Margarita on their patio. Coffee: Lost Dog Cafe for brunch or coffee. Shop: Bert’s Market. Bert lost the keys years ago, but the 24/7, 365 grocery store lives by its motto, “We may doze, but we never close.” Good organic eats, drinks, beer. Surf wax. Things to do: The Washout is where the surfers head in the early morning. Paddleboard through Folly’s estuaries. Take a boat tour to the the Morris Island lighthouse, and watch dolphins on the way. Fish, walk, or birdwatch on the Folly Beach Pier, the second longest on the East Coast. This town has the Washington hit list- craft beer, great coffee, stunning mountains- coupled with its phenomenal beach. Drinks: Bog Water Brewing Company or Westport Brewing Company (has a beer garden and backyard seating). Eats: Half Moon Bay Bar and Grill has marina-front dining (and is said to have Washington’s best Bloody Mary). Coffee: Tinderbox Coffee Roasters for small batch roasted coffee. Other things to do: Catch the yearly Blues Festival in September or the pirate festival in June. In addition to its beaches, this town is also home to several popular festivals and is considered one of the best small beer cities in America. Drinks: Thrillest called 7 Monks Taproom one of the best beer bars in America. Eats: Breakfast at The Omelette Shop. Lunch at Bay Bread Co. Dinner at The Cook’s House restaurant. Cafes: Grand Traverse Pie Company is famous for their award-winning pie. Things to do: The town is becoming the center for Michigan’s under-the-radar wine region. Attend Michigan’s largest film festival (hosted by Michael Moore) at the State Theater. The National Cherry Festival, held in July, hosts hundreds of thousands of tourists each year. Wind-surfing, fishing, kayaking, horse-back riding, paddle-boarding- you name it. No beach activity is left behind in this Texas gulf coast town that also throws a raucous spring break. Drinks: Louie’s Backyard. Tequila Sunset for live music and a sunset view. Eats: A late breakfast at Manuel’s in Port Isabel (no need for lunch, that way). Or, head to Boomerang’s for a small lunch. Grill lobster tails and shrimp from Dirty Al’s for dinner. Coffee: The Grape Vine Cafe. Other things to do: Explore the Padre Island National Seashore on an ecological tour. Go horse-back riding on the beach. Catch the Texas International Fishing Tournament which draws crowds each year.